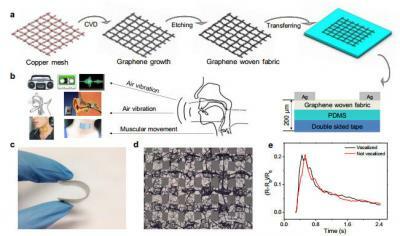 Chinese researchers developed and tested a highly sensitive wearable sensor, made of woven thin films of graphene on elastic polymer/double sided tape film, for sound signal acquisition and recognition. When the sensor is stretched, random cracks appear and decrease the current pathway (increasing the resistance). The film could therefore act as a strain sensor and can be, for instance, put on human throats to measure a person's words through detection of muscle movement, even without actual words being sounded. The sensor is highly sensitive and can make out even fast and low frequencies of sound, and in the future may even be coupled with artificial intelligence to form sensors that could deal with complex acoustic systems and large quantities of audio data. The possible applications of such a sensor are many, and could, among others, include medical aids, earthquake monitoring, animal communication and robot voice development.